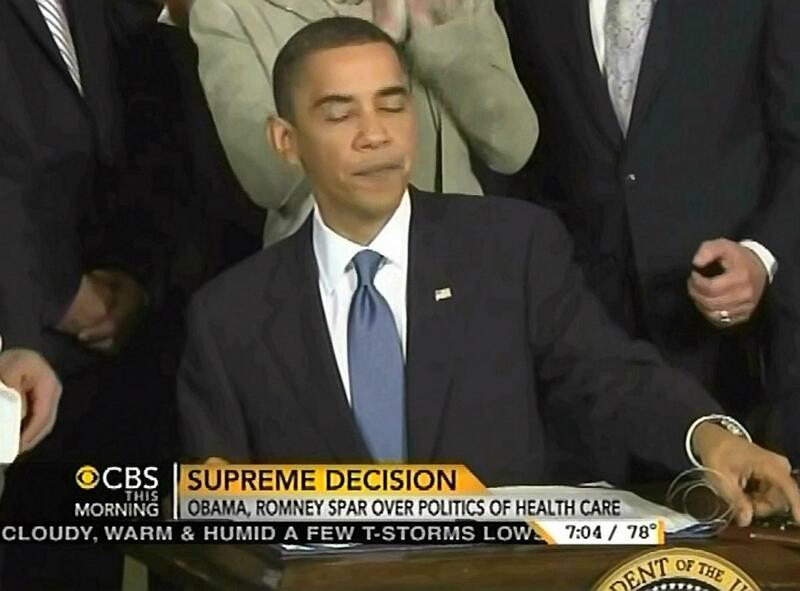 In the wake of the Supreme Court ruling that ObamaCare is constitutional as a tax, a number of media outlets played the now-embarrassing clip of Barack Obama insisting the law isn't a tax. Despite the footage coming from a 2009 interview on This Week, ABC's journalists studiously avoided highlighting their own footage. CBS, however, played it. Even The Daily Show on Comedy Central highlighted the September 20, 2009 interview. On CBS This Morning, Jan Crawford played the clip of Obama telling George Stephanopoulos: "For us to say that you've got to take a responsibility to get health insurance is absolutely not a tax increase." [See video below. MP3 audio here.] On Friday's Good Morning America, Jake Tapper tried to remind Stephanopoulos of the moment. Tapper prodded, "And you have them talking about how it is a tax, despite President Obama telling you in an interview in 2009 that it isn't, this fine on those who do not purchase health insurance." Although that might have been a good moment to play the clip, Stephanopoulos kept ABC's viewers in the dark. GEORGE STEPHANOPOULOS: And Terry, this is so interesting and ironic in many ways, because all through this fight for health care, the White House was insisting that this mandate was not a tax. Then, they went into the courts and argued that it was. Now, it has been upheld because the court has decided, indeed, it is a tax. But, again, he didn't play the clip. It didn't appear on Thursday's World News or Nightline either. Generally, networks and hosts are proud of their scoops and exclusive interviews. One would think that ABC would want to highlight such a (now) relevent interview. Unless, of course, the goal is to protect Obama. STEPHANOPOULOS: Thanks, Terry. Let's bring in Jake Tapper from the White House as well. And Jake, let me begin with you. Big victory for the President. But of the ironies is that chief Justice Roberts used as an argument, that the mandate is a tax that the President had rejected. His opponents already seizing on it. Calling this a huge tax increase. How will the White House defend against that? And do they think that this will be issue will be a political winner for them in November? TAPPER: Well, Republicans certainly think it's going to be a political winner. You have Mitt Romney already raising more than $4 million online. And you have them talking about how it is a tax, despite President Obama telling you in an interview in 2009 that it isn't, this fine on those who do not purchase health insurance. But the Obama campaign is seeking to cast this within the realm of all the middle class tax cuts they want to provide to the American people. And they're seeking to make this, as you heard in Terry's piece there, an example of the president's leadership, doing what's right even when it's unpopular. Much in the same way that George W. Bush sold himself in 2004, supporting the Iraq war because you knew he stood for something, even if you disagreed with him. STEPHANOPOULOS: And, Jake, take us behind the scenes in the Oval Office yesterday The president came out of the office to watch the decision. For a few minutes there, he actually thought he lost. TAPPER: It was a little crazy. Cognitive dissidence is what one of his aides called it. He was standing outside the Oval Office and there's an area called the outer oval. He looks at a TV. There's a split screen with four different cable channels. Two of them are erroneously reporting that the health care law had been overturned. He just stands there with a quizzical look on his face. But then, his White House counsel, his top lawyer comes in,gives him double thumbs up. Tells him that they have upheld it, a weird moment. But his aides say, he was very calm. Of course, what are they going to say? STEPHANOPOULOS: But, as you said, Terry, everyone was surprised by the role of chief Justice Roberts here. And there has been a lot of speculation over the last 24 hours that, in fact, he switched his vote late in the game. TERRY MORAN: It' a detective story, George. In this opinion, legal scholars are pouring through it, searching for and finding clues that something big happened at the last minute. That he switched his vote. And what they're finding is that the dissent, in particular, reads like it was originally thinking it was going to be the majority of the opinion. It's written, "we conclude." One of the many signs showing that Chief Justice Roberts may have switched his vote.